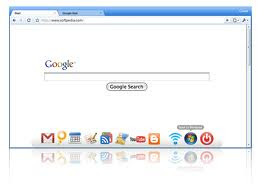 Google Chrome OS is an up coming LINUX-based, open source, lightweight operating system(and will be available to use at no cost) that will initially be made for netbooks. It is expected to be launched in the year 2011 before windows launches its new operating system.Google Chrome OS is being created for people who spend most of their time on the web, and is being designed to power computers ranging from laptops to full-size desktop systems.All web-based applications will automatically work and new applications can be written using your favorite web technologies. And of course, these apps will run not only on Google Chrome OS, but on any standards-based browser on Windows, Mac and Linux thereby giving developers the largest user base of any platform.Google is working with companies like Acer, Adobe, ASUS, HP, Lenovo, Qualcomm, Texas Instruments, and Toshiba(some more companies may be involved but i have no idea about them). The image on the right shows a screenshot of the awaited Google Chrome OS.Though it looks more like the chrome browser but it has applications on the bottom like the dock in MAC and most of these are web based applications. ( As wriiten a few lines above-Google Chrome OS is being created for people who spend most of their time on the web). 1. Will Google Chrome OS replace Ubuntu? 2. Will this release affect Microsoft on a large scale? 3. Last but not the least - Will it come up to our expectations with the brand name of GOOGLE?